To improve marine safety by determining the circumstances and causes of marine casualties, and promoting action to prevent reoccurrence. To be one of the most professional, effective, trustworthy and influential marine safety investigation authorities in the world. The MAIB receives around 1,200 reports of accidents and incidents each year. 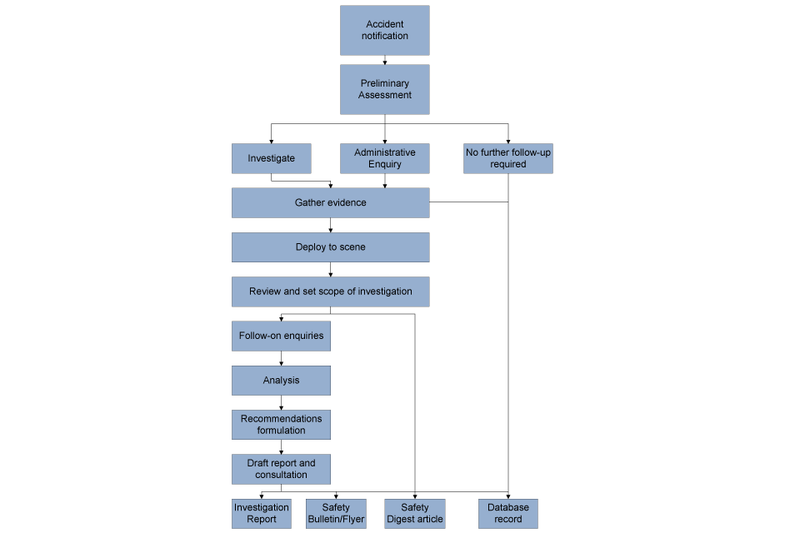 The simplified schematic below shows the sequence of events involved in investigating an accident. A Preliminary Assessment is carried out based on the information received and gathered. If a decision is made to investigate an accident, a team of inspectors is deployed to gather evidence and conduct interviews in order to gain a proper understanding of the circumstances and causes of the accident or incident. After initial analysis, the findings are presented to the Chief Inspector for a decision about the scope of the investigation and to establish the need for any urgent safety recommendations. Further work may then be undertaken and recommendations formulated where necessary (see below). Draft investigation reports are subject to a statutory 30-day consultation process, the results of which are considered before the final report is published. If, after the Preliminary Assessment, it has been decided not to deploy, an Administrative Enquiry will take place, which normally involves the gathering of evidence through correspondence or by phone, although face-to-face interviews and site visits are conducted as appropriate. Details of all accidents and incidents are currently recorded on the Branch’s Marine Casualty Database and the European Marine Casualty Information Platform (EMCIP). Those accidents and incidents that fall within the remit of the IMO’s Global Integrated Shipping Information System (GISIS) database are transferred accordingly. MAIB’s investigations usually result in the Branch making recommendations to those stakeholders best placed to implement them. These can include vessel owners and operators, port and harbour authorities, and industry and regulatory bodies. Recommendations are made for the purpose of ensuring that action is taken that will help prevent a re-occurrence. Industry experts are consulted to ensure that recommendations are proportionate and achievable. Recipients of MAIB recommendations are required to inform the Chief Inspector whether or not they accept them, and provide details of their plans for implementation. The Chief Inspector makes publically available the status of all recommendations in his Annual Report to the Secretary of State. A key facet of the MAIB’s work is the promulgation to its stakeholders of safety lessons identified during its investigations. Importance is attached to identifying the optimum means for disseminating these messages most effectively. Publicly available, digitally and in print, they contain a factual account, analysis, conclusions and recommendations. Communicate urgent safety lessons and recommendations that must be brought to the industry’s attention before the main investigation report is published. Short descriptions of the key findings of an investigation aimed at being read by key stakeholders as quickly as possible. They will accompany publication of an Investigation Report. Produced every six months containing anonymised articles based on investigations and administrative enquiries, with an emphasis on the lessons to be learned. Specialised fishing vessel and leisure craft editions are also produced on an occasional basis. From time to time the Chief Inspector will commission a Safety Study to be conducted. This will focus on a particular aspect of marine safety and is likely to be in response to identified accident trends and emerging concerns. In 2019 it is planned to publish the outcome of a comprehensive Study into the use of electronic navigation aids on a range of vessels. MAIB’s website is a resource delivering safety messages in a number of forms. As well as providing access to every investigation report the Branch has published since it began operating in 1989, the website continues to be developed with further work planned. MAIB’s YouTube (maibgovuk), Facebook (maib.gov) and Twitter (@maibgovuk) presence will continue to be an important means of communication. An Annual Report to the Secretary of State is produced and published, providing a comprehensive set of accident statistics derived from the MAIB database, and a register of recommendations made during the year and the responses made to them. Information leaflets are published on the MAIB website and carried on deployments by inspectors. They are used to inform stakeholders involved in an investigation about the role of the MAIB and the processes involved. MAIB Inspectors will continue to provide support to Coroners and Procurators Fiscal in the event of deaths caused by marine accidents that occur in UK territorial waters or on UK-registered vessels overseas. In practice, this often involves MAIB inspectors appearing at inquests and fatal accident inquiries to explain the contents of investigation reports and the findings of investigations. In England and Wales such support is defined in the Memorandum of Understanding agreed between the Chief Coroner and the three transport accident investigation branches in October 2017. MAIB staff will continue to engage with industry sectors by delivering a programme of presentations to relevant stakeholder organisations. This will include maritime trade organisations, nautical and fishing colleges, the police and fire services, and leisure craft organisations. The Chief Inspector represents the UK at the Marine Accident Investigators’ International Forum (MAIIF) and its European sub-forum E-MAIIF. MAIIF is an international non-profit organisation dedicated to the advancement of maritime safety and the prevention of marine pollution through the exchange of ideas, experiences and information acquired in marine accident investigation. Its purpose is to promote and improve marine accident investigation, and to foster co-operation and communication between marine accident investigators. MAIIF has Intergovernmental Organisation status at the IMO. The MAIB will continue to offer training for accident investigation practitioners from other countries’ administrations. This includes specific training on the recovery and analysis of evidence obtained from Voyage Data Recorders (VDRs) and other electronic recording devices, but also involves longer-term placements whereby an investigator is embedded within the MAIB inspectorate for several months. The MAIB is an active member of the UK delegation at the IMO’s Sub-Committee on Implementation of IMO Instruments (III) and participates in the Working Group on Casualty Analysis. This group distils lessons drawn from the analysis of accident investigations, so that they can be recommended for consideration by the relevant IMO sub-committees. The Committee meets annually with its next meeting in July 2019, but is active throughout the year via its Casualty Analysis Correspondence Group. The Marine Accident Data Analysis Suite (MADAS) will continue to be developed in co-operation with the National Transportation Safety Board of the USA. This has become the industry-standard platform for marine electronic evidence analysis. Developments within the fields of autonomous shipping, electronic navigation, modern propulsion systems, and other emerging maritime technologies will continue to be kept under review to ensure the MAIB inspectorate are sufficiently informed in these areas. MAIB Inspectors are required to develop and maintain an extensive range of professional skills. The Branch maintains an accreditation scheme comprising theoretical and practical modules covering all aspects of marine accident investigation. On recruitment, all inspectors are expected to successfully complete the accreditation scheme and achieve a Post-Graduate Certificate in Marine Accident Investigation within two years. All Inspectors receive continued professional development and training in core skills such as interview techniques, human factor investigation, and evidence handling, making full use of post-graduate courses where available. The Branch is continuing to maintain its training and development programme for all staff for job-specific skills as well as personal development. The MAIB has held Investors in People accreditation since 1996 and was re-assessed in April 2019. The Board of Accident Investigation Branches will continue to deal with governance issues. It is chaired by the DfT’s Director General for International, Security and Environment and is attended by the Chief Inspectors of the Air, Marine and Rail Accident Investigation Branches, as well as other DfT staff. In 2018/19 work began on a replacement Case Management System for all three accident investigation branches (AIBs). This is being managed from within existing resources by MAIB and is expected to become operational in 2019/20. In 2018, Sir Richard Garwood was appointed as the non-executive Chair of the AICC. A Head of External Communications, who serves all three AIBs, co-ordinates and promotes the safety messages identified during investigations to industry stakeholders and the public. MAIB is primarily funded from the DfT’s Programme budget. However, in 2018/19 it was allocated a Capital budget to cover expenditure on the tri-Branch case management system, and a national database for MAIB aimed at addressing disruptions to data access as a result of the UK leaving the European Union. Where accident investigation services are provided to other countries or international organisations those costs are recovered. The budgets for the 3 years of this Business Plan are shown in the table below, together with the budget for 2018/19.